I am married to Andy and the mom of two awesome girls, Lexie (12) and Jackie (10). 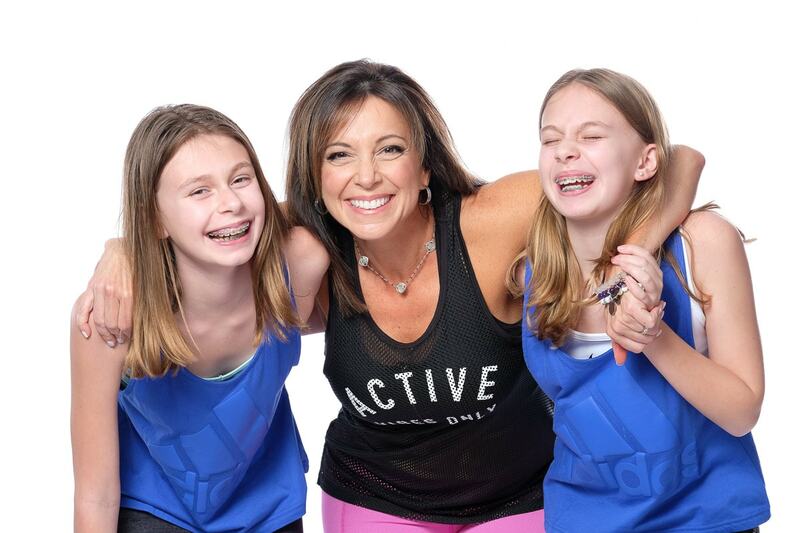 Michele Lehman is such a wonderful example to her daughters about what it means to be a strong & healthy woman! What are your greatest fitness accomplishments? My greatest “accomplishment” is the healthy example I’m setting for my family and the positive impact on our two young girls. There are so many physical, mental, emotional and spiritual benefits to living fit. It’s become an easy, sustainable way of life for me…not an obsession. A big turning point came when I started online personal training with Julie Lohre/Fitbody about 2 years ago. As a result of working with her, I spend less time in the gym and far less time thinking about my health, nutrition, how I feel and look than I did years ago! She does all the “thinking.” I simply execute the plan and focus energy on other areas of my life! It’s easy to focus on “external” transformation. I lost fat. Gained muscle. But the more important transformation was internal. My confidence soared. I was free of body image issues. The discipline positively impacted areas of my life. My overall health jumped to a new level as well. Flexibility and endurance both improved. Bloodwork during physician visits confirm the positive impact on my health. All this led me to feeling great, filled with energy and able to give my best to my family and those around me. "...the more important transformation was internal. My confidence soared. I was free of body image issues... All of this led me to feeling great, filled with energy and able to give my best to my family and those around me." What do you love most about fitness? I love working toward a goal! Each day brings a new opportunity to take steps to get healthier. You don’t need to set aside fitness goals as you get older. It’s simply not true that your body will never be the way it was or you have to live with declining fitness levels. I’m living proof that no matter what your age you can make changes and be in the best shape of your life. What motivates you to maintain a healthy lifestyle? Living a healthy lifestyle helps me be my best spiritually, mentally and physically. My priorities are clear….God, Andy, my family and serving others. My current goals are to get stronger, improve my endurance and flexibility and continue to support our family’s healthy, active lifestyle. Julie Lohre’s plans are unlike any nutritional/workout plans I’ve had in the past. I eat a wide variety of clean foods (healthy fats, protein, complex carbs, fruits and vegetables). My workouts are always varied and include stretching, different forms strength training and cardio. They work perfectly with my lifestyle and I work out around my schedule so it doesn’t interfere with my family or work. It’s also great to know Julie is simply an email away! There is nothing I’d change about working with Julie! What is your favorite clean eating food? Anything with Beverly International Chocolate Ultimate Muscle Protein!